Although one child in 68 is diagnosed with an autism spectrum disorder, psychologist Anne Ross is stunned when she learns her son has Asperger's Syndrome. The diagnosis propels her more deeply into her life's work with children on the spectrum. Her compelling and lyrical story of raising--and launching--her son is one of anguish as well as joy, and what she learns along the way will help other families who are living this perplexing, remarkable, and humbling journey of parenthood. Anne K. Ross is the pen name for an award-winning writer and school psychologist with three decades of experience working in public schools in Northern California. She holds a master's degree in educational psychology, a Ph.D. in clinical psychology, and an MFA in creative writing. She is a past winner of an American Psychological Association dissertation research award, and she has published in professional and literary journals. Her creative writing has been nominated for a Pushcart Prize and a Lambda Literary Award. She is the mother of two young adult sons. Well-written, honest, and insightful. Complementing clinical experience with her personal story, Anne Ross highlights both the common features of Asperger's and the individual differences in presentation. She pulls no punches in exploring the darker side of the syndrome and acknowledging her own parenting mistakes. Clinicians, families with members on the spectrum, and people who simply have an interest in an increasingly visible syndrome will find this book accessible, engaging and thought provoking. Dedicated work, teaching, and mentoring is required to enable a young adult on the autism spectrum to be successful. Anne Ross will show you how her tireless persistence paid off. As both a school psychologist and parent of a child with an autism spectrum disorder, Anne Ross provides double insight into understanding and supporting someone with Asperger's Syndrome. Her story is engaging, informative, and accurate. Parents and professionals will benefit greatly from her wisdom. Beyond Rain Man adds a fresh and unusual dual perspective on autism-seeing one's child through both a psychologist's and a mother's eyes. An honest account of how a professional learns from her son to help other parents. 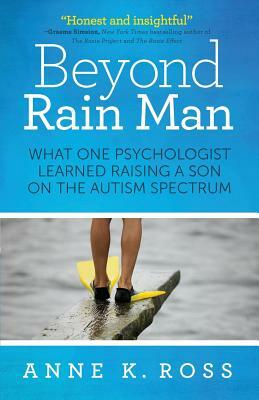 A highly moving and informative work, Beyond Rain Man is the personal journey of a school psychologist parenting a child with Asperger's from his birth up to his departure for college. This book will be of great interest to families with a child on the autism spectrum, and its blend of personal and professional insight makes it unique in the field. Anne Ross brings to life the clinical list of symptoms and problems of Asperger's: rigidity, perseveration, tactile defensiveness, clumsiness, concrete thinking, and more, with remarkable honesty that can be painful but also humorous. This is a book that every parent of a child on the spectrum can relate to and every professional who works with these kids can learn from. Anne Ross writes with honesty and intimacy reminiscent of friendship, and without sentimentality she captures how humbling it is be a parent. A psychologist working with families, Ross shows fellow professionals that a dose of humility can increase our effectiveness tenfold, delivering this message through vivid storytelling more lasting and impressive than any lesson learned in graduate school. This book and the real people in it will stay with you long after you've turned the last page. Valuable insight from a parent and psychologist in the trenches. I wish I had this book when my son was diagnosed with autism. Honest, riveting, and instructive. A must-read for new autism parents. Anne Ross captures perfectly what it feels like to be on both sides of the table-as a public school special education expert and as a parent of a child who required special education. Her story is both heart breaking and joyful, and she generously shares it so that other families' passages through child raising will be made smoother.